Visitors to Kyoto’s famous Nishiki market often wish they had arrived at mealtime, for the sights and fragrances are too tempting to describe. So if hunger strikes at any time of the day, head to Mochikiya, located on the south side of the Nishikikoji-dori just east of Yanagibamba street. Mochikiya specializes in all things made with mochi (pounded rice cake), and we recently tried their sampler, which led to a widening of our perception of this very plain but delicious snack. But first, we should explain why the mochi here is special. It’s the mochigome (sweet or glutinous rice), of course. Here, they only use mochigome grown in the Kyoto area especially for this shop, and it's considered to be of particulary high quality. 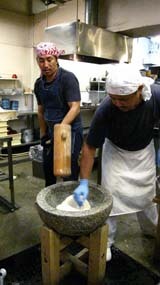 Added to this is the freshness, as all the mochi is made throughout the day, each and every day, here at the main store. 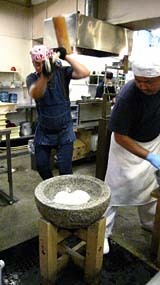 Stacks of seiro (steamer boxes) sit atop large vats of boiling water, and mixers pound the steamed rice into loafs and plump round cakes and daifuku (mochi filled with bean paste). 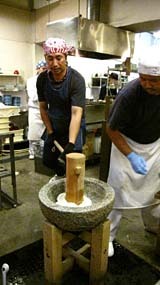 At around 1:15 in the afternoon, there’s also a mochitsuki (mochi pounding) demonstration, which always draws a crowd. Mochitsuki is now a mostly ceremonial event that takes place in private homes and in the countryside on December 31. Above: Bite-sized mochi appetizers topped with a variety of delicious toppings. 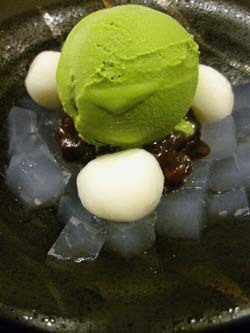 Below: Anmitsu, a traditional Japanese dessert featuring matcha (green tea) ice cream and mochi. 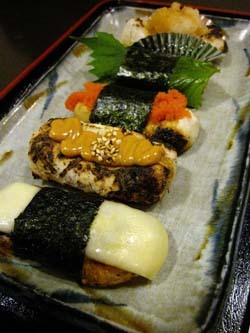 Mochikiya is located on Nishiki-koji dori just east of Yanagibamba street. Back to the sampler: Five finger-sized rectangular skewers of mochi are topped with various (and sometimes surprising) ingredients: 1. Cheese (an increasingly popular combination of East and West) and nori (seaweed) 2. Sesame paste and sesame seeds; 3: Tarako (salted cod roe) 4. Umeboshi (pickled plum) paste wrapped in a shiso (perilla) leaf and 5: Grated daikon (radish). All in all, it's a great way to enjoy mochi five different ways, for only 700 yen. Since mochi has almost no flavor of its own, it serves as the perfect setting for big flavors, and the combination of crunchy, toasted exterior and soft and sticky interior is a pleasing one. We vowed to try making these as canapés for our next party. In the front of the store, packages of freshly made, plump and pristine-looking round mochi are available and will make any visitor long for a kitchen. Unfortunately, they don’t keep well, as they only stay soft for a day. But that is the beauty of mochi. It is most often found packaged in dried form, and only takes re-heating to bring it back to its formerly soft self. Blocks of the dried variety (in rectangular form) are also available and last up to 2 weeks. Just place one over a grill or in a toaster oven. It will expand as if it's a balloon, often with an air bubble, and the top will become nice and toasty. One simple way to enjoy roasted mochi is to dip them into soy sauce sweetened with a little sugar, or, if you wish, brush the tops of the mochi with soy sauce and continue roasting for a minute or so. Wrap with a small rectangle of nori and enjoy.